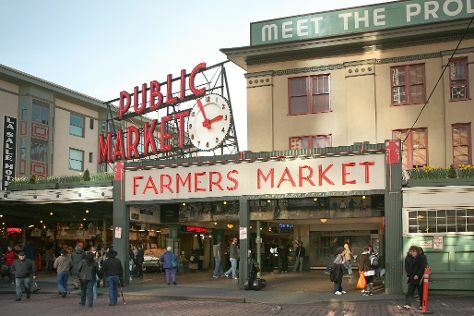 For other places to visit, reviews, and tourist information, read our Seattle trip planner. Valletta, Malta to Seattle is an approximately 17-hour combination of bus and flight. You can also do a combination of bus, flight, and shuttle; or do a combination of ferry, taxi, bus, and flight. The time zone changes from Central European Time (CET) to Pacific Standard Time (PST), which is usually a -9 hour difference. In May, Seattle is little chillier than Valletta - with highs of 23°C and lows of 13°C. Finish up your sightseeing early on the 12th (Sun) so you can travel to San Francisco. Take a break from the city and head to Alcatraz Island and Twin Peaks. Popular historic sites such as City Lights Booksellers and The Embarcadero are in your itinerary. There's much more to do: take a stroll through Fisherman's Wharf, shop like a local with Union Square, buy something for everyone on your list at Ferry Building Marketplace, and make a trip to Nob Hill. To find traveler tips, ratings, reviews, and more tourist information, go to the San Francisco day trip site . Traveling by combination of flight and subway from Seattle to San Francisco takes 4 hours. Alternatively, you can fly; or drive. In May, daytime highs in San Francisco are 24°C, while nighttime lows are 13°C. Wrap up your sightseeing on the 15th (Wed) early enough to travel to Las Vegas. On the 16th (Thu), stop by Barneys New York, buy something for everyone on your list at The Grand Canal Shoppes at The Venetian, then get a taste of the local shopping with The Strip, and finally enjoy some music at Bellagio Fountains. Here are some ideas for day two: try to win big at Bellagio Hotel and Casino and then explore the stunning scenery at Red Rock Canyon National Conservation Area. To see where to stay, more things to do, ratings, and other tourist information, use the Las Vegas tour website . You can fly from San Francisco to Las Vegas in 4 hours. Alternatively, you can do a combination of subway and flight; or drive. Traveling from San Francisco in May, expect Las Vegas to be somewhat warmer, temps between 36°C and 20°C. Cap off your sightseeing on the 17th (Fri) early enough to travel to Grand Canyon National Park. Give yourself a bit of retail therapy at Canyon Village Marketplace and Hopi House. Get in touch with nature at Rim Trail and South Kaibab Trail. On the 19th (Sun), hike the day away at Bright Angel Trail. There's more to do: take in breathtaking views at Grand Canyon South Rim and take some stellar pictures from Lookout Studio. To find other places to visit, traveler tips, reviews, and tourist information, go to the Grand Canyon National Park travel itinerary planner. Do a combination of car and flight from Las Vegas to Grand Canyon National Park in 4.5 hours. Alternatively, you can drive; or take a shuttle. Due to the time zone difference, you'll lose 1 hour traveling from Las Vegas to Grand Canyon National Park. When traveling from Las Vegas in May, plan for slightly colder days in Grand Canyon National Park, with highs around 23°C, while nights are cooler with lows around 0°C. Finish your sightseeing early on the 20th (Mon) to allow enough time to travel to New York City. Head to Fifth Avenue and MoMA Design Storefor some retail therapy. Kids will enjoy Central Park and Ellis Island. Next up on the itinerary: admire the masterpieces at The Metropolitan Museum of Art, shop like a local with Shopping Girlfriend NYC, see the interesting displays at New York Public Library, and take a stroll through Times Square. To see more things to do, reviews, photos, and more tourist information, you can read our New York City travel route app . Do a combination of bus and flight from Grand Canyon National Park to New York City in 13 hours. Alternatively, you can do a combination of bus and flight; or drive. Traveling from Grand Canyon National Park to New York City, you'll lose 2 hours due to the time zone difference. Traveling from Grand Canyon National Park in May, New York City is much hotter at night with lows of 15°C. Cap off your sightseeing on the 24th (Fri) early enough to travel back home.